R-TECH Materials increased visitors to its stand by 350%. 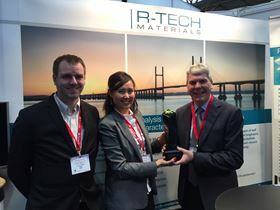 R-TECH Materials, a UK-based testing, analysis and consultancy businesses, said that it increased visitors to its stand by 350% at this year’s Advanced Engineering show which took place in Birmingham in November. The company also received 11 concrete enquiries. R-TECH’s laboratories run tests on all types of engineering materials including composites, polymers, metals and ceramics. Standard tests include lap shear, in-plane shear, climbing drum peel, shore hardness, compression of core materials and shear properties of sandwich panels, as well as fatigue testing (in tension or in bending) at loads of up to 100kN. R-TECH can also offer its customers bespoke testing thanks to its biaxial extensometry, in-house machine shop and strain gauging capabilities. The program has been announced for the 2nd Composites in Sport Conference and Exhibition, being held in Loughborough University, UK, from 3-4 October 2018.